I have a near-three-year-old girl who lives within a mile of both sets of grandparents. This means that some aspect of the Disney princess world will infiltrate our lives (yes, ours, not just hers) with or without my consent. The first foray involved mysterious new references to “Cinderella”, as in “Mommy, is this Cinderella music?” while listening to Tchaikovsky’s Sleeping Beauty. I decided a “yes” was in the spirit of the question. This, however, invited a series of follow-on questions during all episodes of music-listening, usually taking the form of “Mama, what’s Cinderella doing NOW?” At this point, Sleeping Beauty was still in my mind and usually Cinderella was skipping through the forest, singing to birds, meeting dryads and water nymphs, hallooing down wells, and sometimes hopping on one foot in the rain, all very pastoral. But sooner or later, all this Cinderella talk was bound to result in some grandparent or other bringing home from Costco “for a great price”…the dress. Now there’s simply no fighting the fact of the dress. It’s there, at Grandma’s, and once there, it of course must be accessorized through several toddler appropriate projects. All very educational, of course. (Thank goodness making heeled glass slippers is outside of a very capable Grandma’s ken, since I draw the line at unwearable, ankle-endangering shoes.) And once the dress is donned, then, in a very real way to my girl, Cinderella is donned too. So we watched the movie, recently reissued by Disney. I had forgotten how straightforward the princess narrative of Cinderella is. She literally shows up at the ball, and by merely being there and being beautiful, the prince loves her. It’s not clear they actually have much conversation; it is clear that neither knows the other’s name by midnight. Her step-sisters have caricatured features, usually scowling, often yelling. My daughter was shocked by their abuse of each other, and of Cinderella. And it would be easy to see the movie as merely “pretty girl beats ugly girls by being pretty”. But that’s a mis-read of the movie. And it turns out, there’s a lot in Cinderella that I would love my daughter to be inspired by, and that as we talk about her and about her story, I’m hoping to bring out. Let’s take the scene that follows the storybook “back story” that relates the love, well-intentioned re-marriage, and sudden death of her noble father that left Cinderella to the care of a jealous and cruel step-family. In the second scene, Cinderella is awakened to a new day of servitude by troupes of birds and mice and sings the Disney classic “A Dream is a Wish Your Heart Makes”. Now, I’m not sure how much I can rescue a song that seems straightforwardly to promise that believing in your wishes makes them come true eventually. A very charitable read might make of it a proclamation of persistent hope for a future good, in spite of daily circumstances. What caught my eye instead was the relationship between Cinderella and the little creatures. They love her, of course. But what’s more, they serve her, and do so with delight, even ecstasy. They make her bed with grace, plumping pillows expertly. They help her undress and bathe (or “do Cinderella showers”, as my daughter laughs). They lay out her simple clothes neatly and tend to them as if they were finery. They fold ribbons for her hair. They attend her and adorn her. She teases them, receives from them, cares for them, talks to them, sings to them, shares her heart with them. And as news of a new mouse to the household enters the scene, we are suddenly forced to realize something crucial. 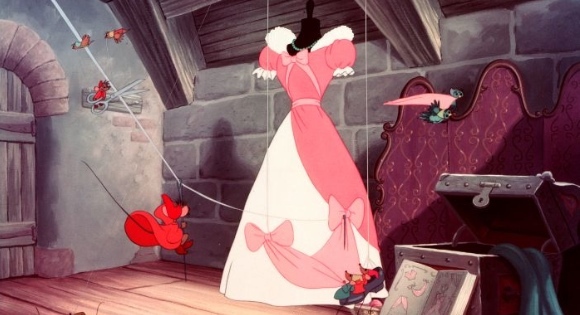 The birds and mice that are acting so human are clothed not because it’s a Disney movie that anthropomorphizes animals, but because Cinderella clothes them. She has a ready stock of booties, pointy hats, shirts, dresses, and aprons, all sized for mice and birds. (Which, as I can now attest after hurriedly sewing something along those lines today for the baby, is a testament to her abilities as a seamstress.) As soon as she hears of a new arrival, she turns to her dresser drawer as to a long-ingrained habit. In that moment, we see the key to her character. This woman is unjustly treated as a slave by those who are in fact her equals. But she treats her inferiors with a grace that not only adorns but lifts them above their natures. After enlisting the help of an intermediary in the form of another mouse, she transforms a terrified mouse in a trap with no powers of utterance into a semi-articulate, sweet-hearted, slightly daft mouse she dubs Octavius, Gus for short. Gus-Gus to himself. Her actions endow him not only with clothes, but with speech, and a name, and with being known by name by a community likewise graced by her. She gives him clothes that don’t quite fit (since that is all she has) and a name that is well above him, but she also gives him a second name that he is capable of speaking and embracing. She raises him above himself, yet still condescends to meet him where he remains. She demands nothing and offers everything. And he loves her. My daughter was silently appalled and teary when Cinderella’s step-sisters violently destroyed her dress. What made her sad was mainly the desecration of the gift. In that sense, she intuited that the dress was more than what Cinderella was wearing to be pretty. The step-sisters rip away their once-detested cast-offs and shred also what was properly Cinderella’s–not only insofar as the dress was an inheritance from her mother, but also insofar as its craft was done in imitation of her very soul. Clearly this movie is interested in clothes, but not in a superficial way at all, because clothes first and foremost are figured as gifts that make visible a life of grace and virtue and its effect on others. Cinderella clothes mice and birds; in return, they adorn her clothes to enable her to claim her rightful place as an equal, if only for a night. And it’s no accident that the running joke in “Bibbity bobbity boo” is that the fairy godmother doesn’t quite see that Cinderella isn’t dressed properly. The fairy godmother is so busy supplying a surplus of graces–not just a coach, but four horses, a driver, and a footman to boot, all transformed again from the animals that Cinderella herself had already transformed–that she doesn’t notice the one essential, a proper dress. And when she finally makes that dress, it is tailor-made to reflect Cinderella’s person, “the shade of her eyes”, “something simple, but daring too”, and finished with glass slippers, which is tradition, I suppose, but also perfect in their transparency and in their reiteration, once again, of grace beyond necessity. Today, my daughter donned her Cinderella dress. I put her golden hair up in a high chignon and fastened the blue ribbon Grandma gave her around her head. I snapped the black velvet choker Grandma and she made together and clipped on the simple bead earrings. She slipped the matching beaded bracelet she made on (“I call these my pearls, Mama”). She wore white socks with black Mary Janes (remember my rule about heeled shoes?). Diane is a medievalist whose specialty is heresy, pedagogy, and the use of religious language. She can be interested in just about anything—modern dance, economics, the chemistry of cooking—and reads widely. She loves to scheme with her husband Dominic and their contemplative preschooler and valiant toddler. Read more about Diane here.